Hello all, this is my first post on a forum, so I am excited. I do have a question though. 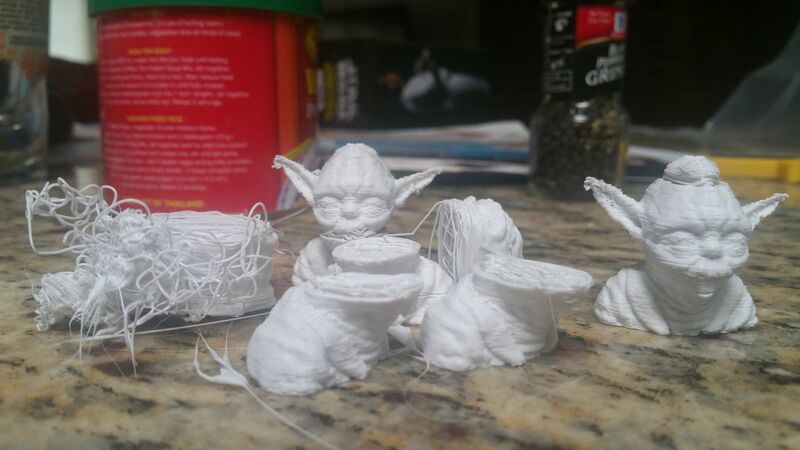 I had my Smartrap Core (wood) running, and I was cranking out Yodas left and right for testing and giveaways when friends came over to see the movie, then all of a sudden the Z axis dropped a little on a print, and I have not been able to print a complete model since. It keeps dropping in essentially the same place every time. I did go through and inspect my z belt, and made sure that I had the proper current going to the motors. I cannot think of what may have caused this between when it was running, and now. If anyone could offer suggestions I would greatly appreciate it. This is my first 3d printer build, so I consider myself a newbie on this subject. I'm quite a newbie myself, I'm at my second smartrapcore so I'd like to take a chance and help you with this. 1. When the current is off, can you move your bed up and down slowly without any resistance? I have found myself overtighting the bearings on the zslide a bit, so it created a resistance on the rods. Also, check the z rods for any irregularities. 2. How did you check the current and know that it is proper? Might be helpful to up/down the current a bit. If your motor gets hot, down it a bit. If not, up it a bit. Hope these questions will help you a bit to look in the right direction. Welcome. Tricky one as motor current, motor cabling, belts all spring to mind. Could be a slicer error, I only say this as yesterday my Scalu printed a model with 0 infill despite me slicing it with 15%. At what z height does it happen and is it repeatable? Does the z axis move smoothly through this position or is it stiction in the rods/bearings overcoming the motor torque at this point. As far as the current, I adjusted the POT on the driver to change the reference voltage, and then check it with the multi-meter. For my drivers the equation is Current Limit = VREF × 2.5. I read the Vref at .675, so my current limit is 1.7. The max for the A4988 is 2A, and the motors are running at 1.7A. I thought this was high, but I tested the temp on the heatsinks, and they were cool. Do I need to crank down the Voltage since the since it is above the constant current of 1A? I had a similar problem when I was first getting the Smartrapcore ALU version working, the bolt that was on the Z axis that was used to tension the belt made itself a hole through the belt. It would work for homing, but as soon as it got any amount of weight on the bed plate, the screw would pop through the belt causing a slack belt and dropping the bed slightly. I ended up just using a ziptie to tension the belt against the Z axis bracket holes and its been good for mine since. I've also seen several people talk about the driver board chips release any heat through the bottom of the chip and not the top between the chip and the PCB, so the provided heatsinks aren't going to be of any use. They also go onto to explain, the PCB underneath the chip really isn't large enough to cool the chips when they do get hot. Edited 1 time(s). Last edit at 06/22/2016 02:40PM by PDBeal. I'd position a permanently on fan over the ramps board to cover the stepper drivers and maybe a second (or box in the ramps/mega and have air flow through) over the mosfets if using them to control a heated bed.